This is your 3 hour jumpstart! Have fun! 50% off EVERYTHING for 24 hours! 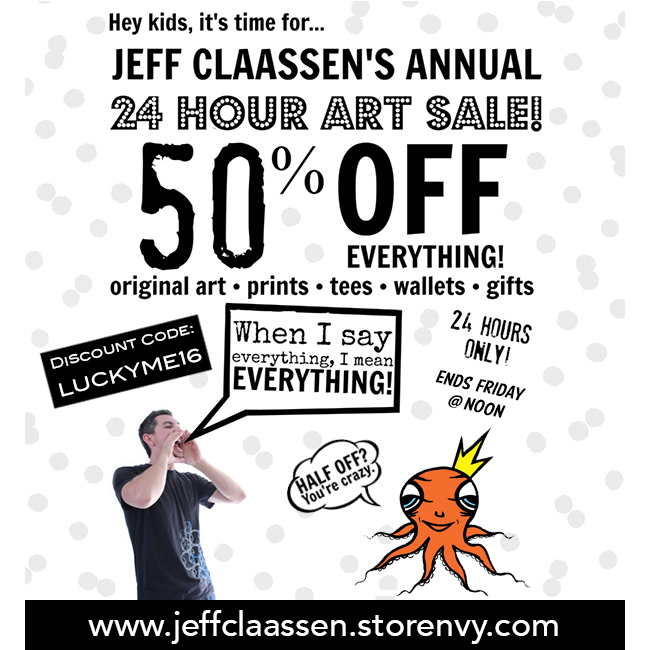 It's been very hectic this last week as I've been preparing for the 5th annual 24 hour sale. I finished 10 new paintings in the last couple of days specifically for this BIG event. This half off deal is my way of saying thanks to everybody who has supported me throughout the year whether it's buying artwork, following my shenanigans on instagram/facebook or just sending words of encouragement and helping spread the word. I appreciate all of it and it truly means a lot to me. This is the biggest sale I have the entire year and it's the only time EVERYTHING in my online shop is 1/2 off. As a loyal email subscriber you are the first to hear about this sale, which means you have first priority over all the other places this will be promoted. This sale will be announced on Facebook and Instagram around 12pm, so take advantage of your exclusive head start. There are currently over 150 items available. Everything from one of a kind originals to handmade wallets, limited edition prints, button packs, keychains and more. Copyright © 2016 Claassen Gallery, All rights reserved.